The inspiration photos shown below for the June Ellen Hutson Pin-Sights Challenge is filled with bright summer floral colors. My project incorporates these beautiful colors in the peonies. I’ve also added a touch of gold around the edges. For information on how I made this project and the supplies I used, read on below. I blended three of the colors (Abandoned Coral, Spiced Marmalade, and Fossilized Amber) from the Tim Holtz Distress Oxide Inks line onto an A2-sized piece of hot press watercolor paper. A mini ink blending tool was used for this. The Distress Oxides blend so smoothly! After getting the colors blended like I wanted, I stamped three peony flower images onto the blended background. I used a black archival ink that would not bleed if I decided to add water splatters to the background. Ultimately I didn’t use water splatters because I thought it might distract from the large blooms and the softly blended, bright background. I wanted the colors to pop so I decided to adhere the card front against an A2-sized black mat. To do this, I had to cut the card front down to 4″ x 5.25″. 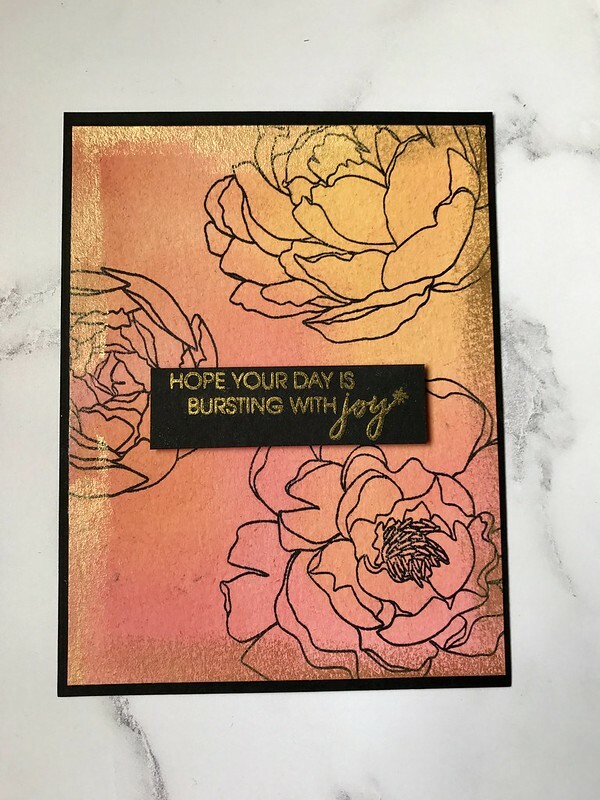 The flowers against the black mat were striking, but to further emphasize this, I smudged Nuvo Embellishment Mousse in Indian Gold around the edges of the card front. This was done before I adhered the card front to the black mat. The entire front was adhered to an A2 card base. I stamped the sentiment onto a black strip of cardstock using gold ink. The strip was mounted onto the card using foam tape. Stamps: Ellen Hutson Essentials by Ellen: Mondo Peony stamp set; Essentials by Ellen: Lovely stamps set (sentiment). Inks: Distress Oxide Inks: Abandoned Coral, Spiced Marmalade, and Fossilized Amber; Ranger Archival Ink in Jet Black; Tsukineko Delicata Ink in Golden Glitz. Cardstock: Hot press water color paper; Bazzill Cardstock: Licorice Twist. Other: Nuvo Embellishment Mousse in Indian Gold; Misti Stamping Tool. This entry was posted in Challenges, Hello/Thinking of You and tagged Challenge, Ellen Hutson. Bookmark the permalink.